These silicone-hydrogel, monthly contact lenses are designed to help wearers who suffer from a lack of contrast sensitivity and blurred vision in low-light conditions. With ComfortMoist technology, these lenses provide outstanding hydration and comfort. 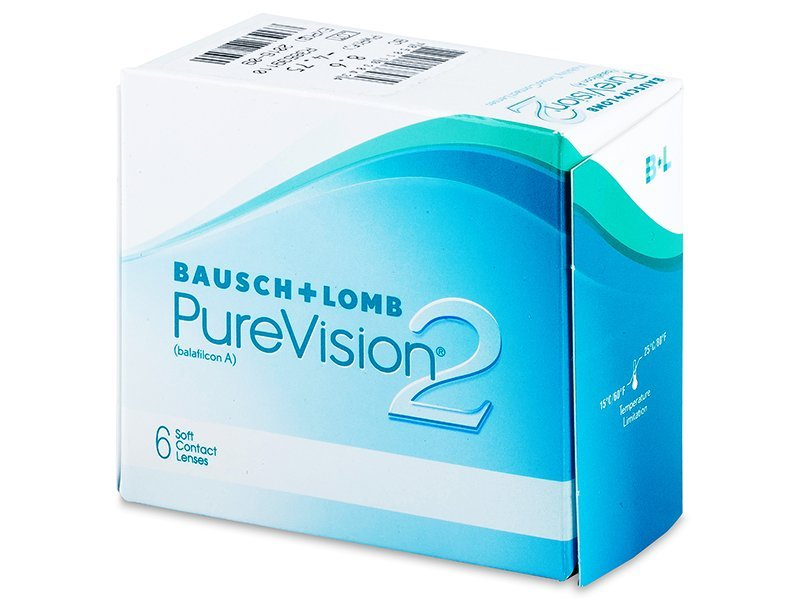 Bausch and Lomb produces PureVision 2 contact lenses, and advanced, silicone-hydrogel model developed for wearers who suffer from a lack of contrast sensitivity and blurred vision in low-light conditions. 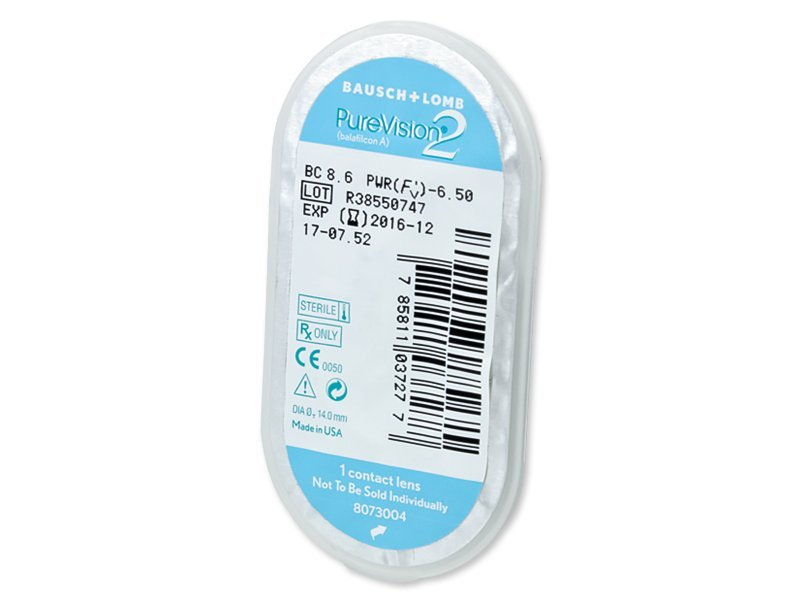 PureVision 2 contact lenses are especially suitable for drivers, students, or sportspeople. PureVision 2 contact lenses are among the thinnest available on the market. Thanks to their ComfortMoist technology, which adds rich moisture to the lens surface, PureVision 2 contact lenses provide outstanding comfort throughout the day. And, despite their exceptional thinness, they are easy to handle. They are recommended by the manufacturer (upon agreement with an eye specialist) for continuous wear with a monthly replacement schedule. This package contains six lenses. Note: There are two versions of PureVision 2 contact lenses packs – one with the HD label (in the bottom right corner) and one without this label. Both versions contain identical lenses, the difference is purely in the packaging. My favourite lenses for many years. Very comfortable and soft. I've tried many types of lenses but this works the best for me. Highly recommend it. Delivery is always on time and Alensa is always adding a nice pen in my package as a gift. Love that pen. Thanks! Not happy at all with the lenses. I’m on the first pair and since day one they were not comfortable. They feel like having sand in the eyes. Tried to clean them several times before wearing, but the result was the same. Couldn’t wear them for more than a few hours before my eyes got very irritated. The only positive thing was the price. 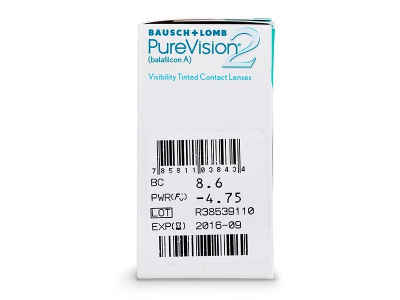 Are Purevision 2 approved extended wear lenses? Would like to not have to clean them when I'm travelling through the week. Thanks for any information and/or advice. 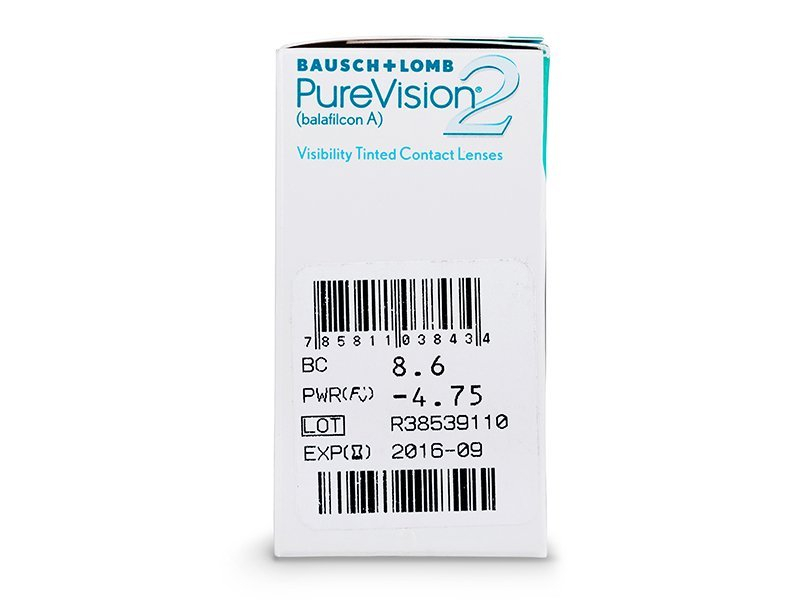 Hi- what is purevision 2 dk t and what does the number mean? Hi Jordan, dk/t refers to the lenses oxygen permeability and transmissibility. The value of 130 dk/t is one of the highest of any lens on the market, so these lenses allow quite a lot of oxygen to reach the cornea. The higher the dk/t, the more comfortable the lenses may be. Sturdy, reliable lenses. 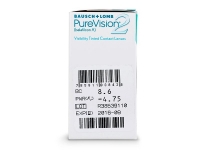 I've counted on Purevision for many years, and have never been disappointed. Always in stock, and delivered promptly. Much better than the Purevision. I'd been wearing those for years, and they were giving me red eyes and a lot of irritation. With the HD, I can even sleep in them occasionally with no problems. Nice upgrade from the regular Purevision. There's a big difference in comfort. Is there any yearly disposable soft contact lens? Thank you for your recent comment. Unfortunately, we do not offer a yearly lens. This particular lens, however, is very suitable for extended wear throughout a 30 day period. We also offer https://www.alensa.co.uk/…qua-6-lenses which allows for extended wear also during a 30 day period.